This small hinged tin will make a big impression on your clients or guests. Get your company logo or design printed directly on the lid with the highest quality print technology currently available on the market. Choose from various tin colors and six different mint & candy fillings for a corporate gift that is perfectly suited for your brand and event! Choose a fill that works best for your event theme, occasion or branding goals. You can even match your corporate colors with a variety of different candy options! Please note pricing varies for the various fills - you can update the pricing table by clicking on the respective fill icon at the top of the page. Looking for more fills? Simply reach out to us if you are looking to have the tins filled with an option that is not listed above and we will provide you with a custom quote. The small hinged tins are available in black, white, or silver. The inside of the tins is always silver. There are two different imprint options available depending on your artwork. 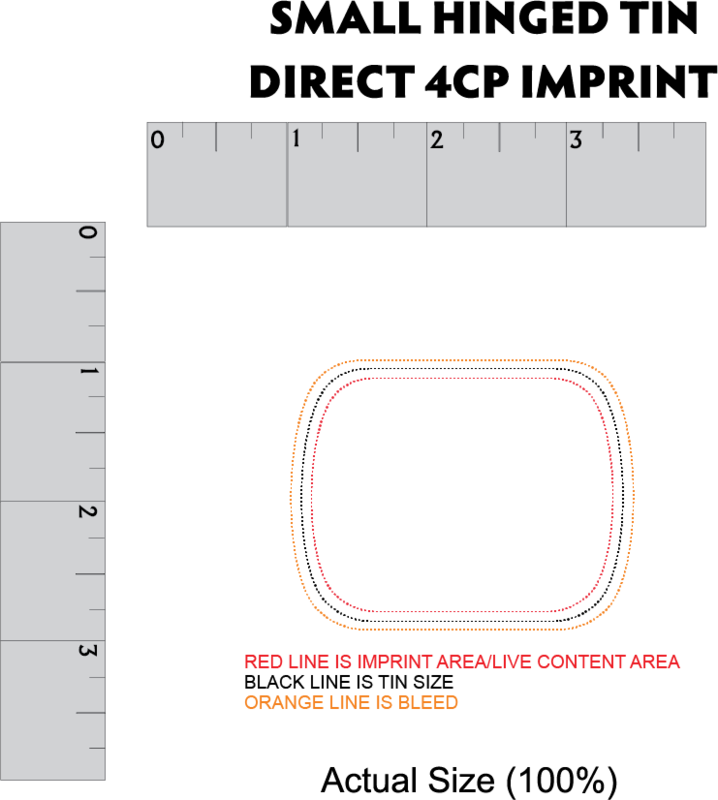 Direct Imprint on tin: If your artwork consists of only one or two colors, we recommend this imprint method. We can match your exact Pantone colors to make sure your corporate gifts are in line with your corporate identity. The $49 setup fee covers one color. If you have a 2-color logo, another $49 setup fee would apply for the 2nd color. 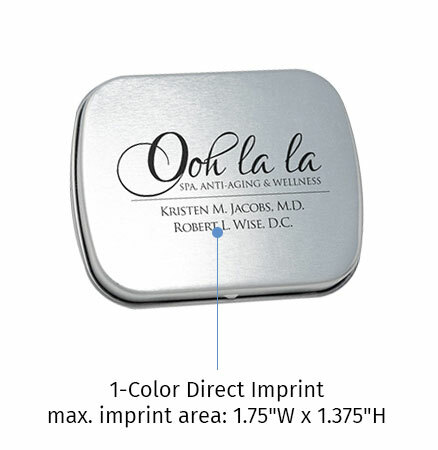 The imprint area on the tin is 1.75"W x 1.375"H.
Full-color direct imprint on tin: This option is perfect for colorful artwork and works with all tin colors, however we cannot guarantee an exact PMS match since the artwork is printed digitally. The colors will be as close as possible to your specific PMS tones. 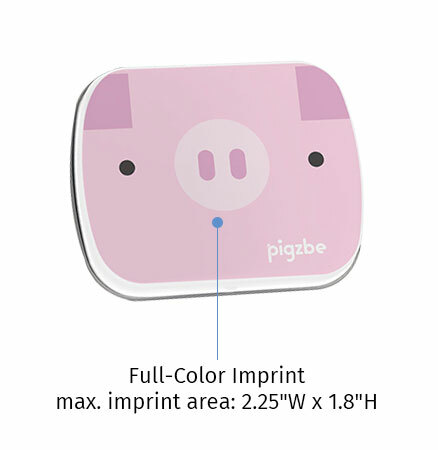 This imprint option also maximizes the imprint area on the lid with 2.25"W x 1.8"H.
You can use the artwork layout below to position your logo or design on the product. We highly recommend to use vector artwork for the mint/candy tins. If you prefer to have our graphics department set up the artwork for you, simply send us your PDF vector files and we will do the work for you at no additional cost. Either way, you will receive a free, "no-strings-attached" proof so that you can see exactly what the final product would look like. Working with Iria Randall was such a pleasure. She was very knowledgeable about the products and worked with me to get the artwork to the right format. It was very helpful to receive a sample ahead of time of the item we wanted to order. Everything arrived on time and exactly as expected.